The Information Governance Conference, or InfoGovCon, is a fantastic event for information professionals run by my friends at the Information Coalition. This year's event, held September 25-28 in Providence, will mark InfoGovCon's 5th year. I spoke the last 2 years, and I won the 2016 Information Governance Expert of the Year award. 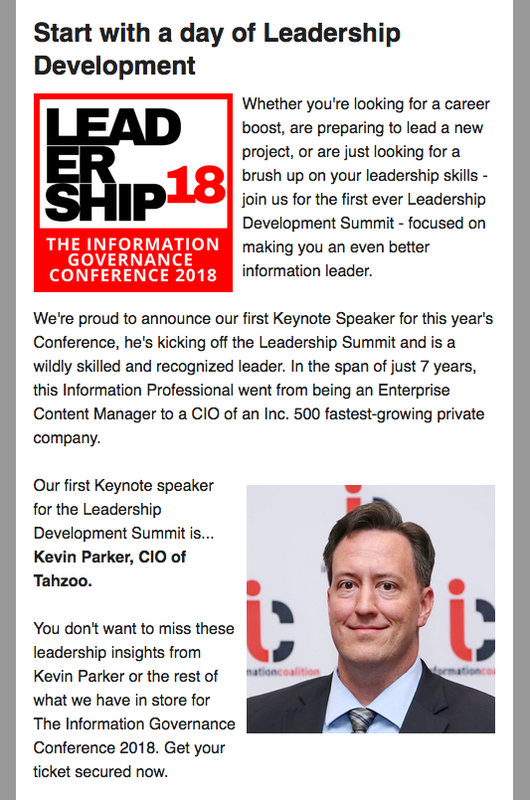 At #InfoGov18, I am excited to be a keynote speaker, kicking off the very first Leadership Development Summit. And InfoGovCon is a prestigious event. Last year, one of the keynotes was the Governor of Rhode Island, who gave a very informative talk about delivering information technology solutions to public sector customers. That's the kind of company I'm in! Get your tickets for #InfoGov18 today! Need a speaker for your Information Management or Technology event? Contact me. All Content © J. Kevin Parker. Simple theme. Powered by Blogger.